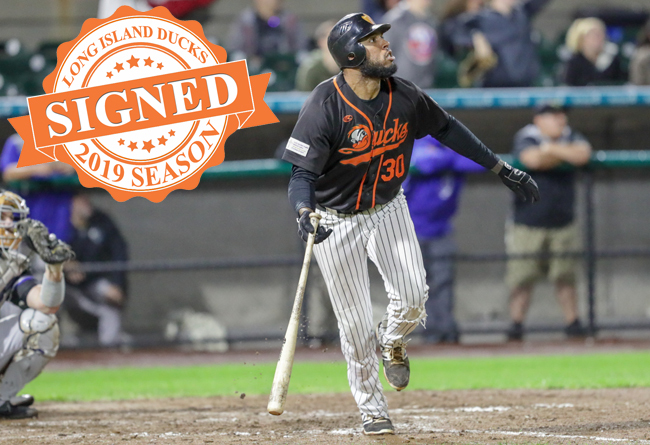 (Central Islip, N.Y., Feb. 25, 2019) – The Long Island Ducks today announced the signing of infielder David Washington. The former Major Leaguer enters his second season with Long Island and 11th in professional baseball. Washington returns to the Ducks after leading the team with 24 home runs in 2018. That total ranked second in the Atlantic League, trailing only Lancaster’s Blake Gailen (28). The San Diego resident also led the Ducks in walks (51), tied for second in RBIs (71) and games played (113), and tied for third in runs scored (63). Washington was selected to play in the Atlantic League All-Star Game, held at Long Island’s Bethpage Ballpark, and reached the championship round of the pre-game Home Run Derby. The first baseman went on to set three franchise postseason records and equal another in Long Island’s Liberty Division Championship Series win over the Somerset Patriots. He collected the most RBIs in a single postseason series (9), recorded the most RBIs in a single postseason game (6, Game Two), and became the first Duck to hit multiple home runs in a postseason game (2, Game Two). Additionally, he equaled the most homers hit in a single postseason series (3). With the Ducks facing elimination in Game Three of the Atlantic League Championship Series, the slugger launched a game-winning, two-run homer in eighth inning to keep Long Island’s season alive against the Sugar Land Skeeters. In 10 playoff games overall, Washington totaled four homers, 11 RBIs, six runs, eight walks and four stolen bases. Prior to joining Long Island, the 28-year-old reached the Major Leagues with the Baltimore Orioles in 2017. He spent the majority of that season at Triple-A Norfolk, hitting .264 with 18 homers, 42 RBIs, 49 runs and 23 doubles. The slugger spent the first eight seasons of his career in the St. Louis Cardinals organization, reaching as high as Triple-A Memphis in 2016. He was named an MiLB.com Organization All-Star that year and previously earned New York-Penn League All-Star honors in 2013 with the State College Spikes. Washington was originally drafted by the Cardinals in the 15th round of the 2009 amateur draft.